Sometime this weekend, The Otter group blog became the most-visited project ever on the NiCHE website. It overtook the first edition of The Programming Historian, a longtime hit with the digerati, among others. (That audience now more often visits the second edition of The Programming Historian, off our site.) It seems like a good moment to congratulate Jim Clifford on starting up The Otter two years ago. Building on his experience with Active History, Jim pressed and cajoled a series of contributors to start things off, and the result convinced a chorus of more bashful folk to join in. Kudos. Congratulations and thanks to Josh MacFadyen, too, for taking over the efficient running of the Otter over the past year. I’m often asked – ok, I’ve never been asked – why it’s called The Otter. Our original placeholder title was Nature’s Chroniclers, a name self-important and possessing all the aural elegance of The Rural Juror. Since The Beaver had recently changed its name, we thought about calling it that, but then remembered what had happened when Bob Wiseman tried to become Prince. So we chose The Otter, in part to riff off The Beaver and in part – of course – for the pun. We wanted it to be a place for the environmental history / historical geography community not only to offer scholarship but also to offer opinion pieces, to be prescriptive, to suggest what we – scholars, Canadians, people – ought to do. And it is such a place, and that’s why it’s been popular. That’s enough porchfront, rockingchair reminiscence for one post. 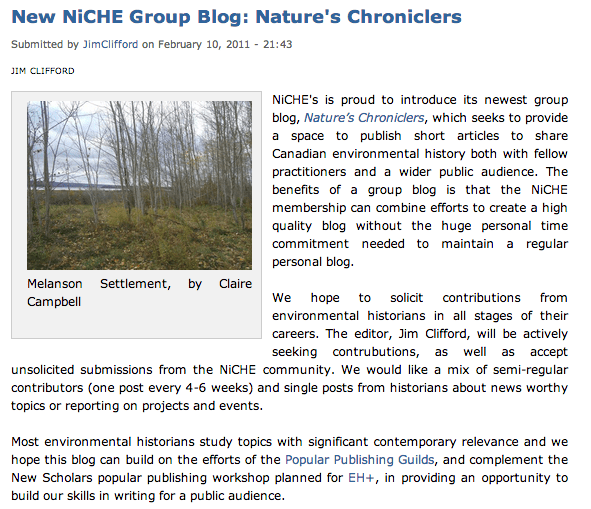 Next time, I’ll tell you how NiCHE almost became CHiEN.